Mumbai: India’s piecemeal steps to defend the rupee can do little more than slow its decline for now, and some of the measures risk hurting the currency in the long term. In particular, new central bank rules that reduce trading limits of Indian banks and companies could have the unintended effect of hampering their ability to hedge, choking off market liquidity and driving a chunk of trading to offshore markets. The rupee’s weakness - a drop of nearly 20% from July highs to a record low last week - reflects the increasing doubts of foreign investors over the ability of India to tame high inflation, prop up falling growth and rein-in its large fiscal and current account deficits. Thinning liquidity could amplify volatility, dragging the rupee beyond last week’s record low if bearishness morphs into a full-fledged selloff. “Structurally, it will reduce liquidity and this will mean more volatility in the long run, but this is acceptable as the move reduces pressure for now," said Dariusz Kowalczyk, senior economist at Credit Agricole in Hong Kong. Restrictions in the onshore market could also drive more flows to the flourishing offshore non-deliverable forwards market, where rupee volumes are exceeded in Asia only by the Korean won and the Chinese yuan. A senior FX trader at a European Bank in Mumbai said onshore banks would be wary of trading large volumes with their clients on worries they would not be able to offset their exposure. The best hope for the rupee, traders and economists argue, is for India to get its fiscal and economic house in order. “As long as India’s fundamentals remain weak, these various capital controls will not help the rupee in the longer term," said Ila Patnaik, an economist at the National Institute of Public Finance and Policy in Mumbai. “By restricting currency trading, the RBI is sending a wrong message out to market participants, especially companies with genuine needs," she said. The RBI has taken a slew of measures to stem the rupee’s fall, including raising quotas for foreigners to buy local debt, encouraging domestic firms to borrow more overseas, and even intervening in the foreign exchange market, something it does only in order to ease volatility. Late on Friday, the central bank lifted the cap on interest rates local banks can pay non-resident Indians on foreign currency deposits, which might attract short term inflows but exposes India to volatile hot money. On Thursday, the rupee sank to a record low 54.30 to the dollar, down almost a fifth from its July highs, making it the year’s worst performing currency in Asia. It got a bounce on Friday after the central bank took measures to curb speculation but it has resumed its decline since then, with market players saying the only way to improve the outlook for the rupee is to turn around a flagging economy. “These are measures which will definitely reduce speculation from the market but what will it do is make the market shallow," said the head of FX trading at an Indian bank in Mumbai. “Desirable or not desirable, it has shown results. This is the most unsophisticated way of doing things and a very crude way of handling things," said the trader, who declined to be identified. India is sitting on more than $300 billion in foreign exchange reserves but that is not as big a pile as it looks given the need to fund a widening current account deficit and a worsening fiscal and economic growth outlook. Because the central bank is neither able nor willing to mount a major market intervention, it is expected to continue using assorted administrative measures in hopes of spurring inflows and boosting confidence. Pressure on the currency is expected to persist. 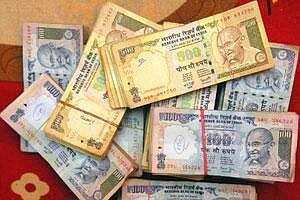 The rupee was trading at 53.03 on Tuesday. Australia’s Westpac Banking Corp has made shorting the rupee against the dollar one of its top trade recommendations for 2012, while UBS expects a test of 55 per dollar. Jamal Mecklai, who heads FX brokerage Mecklai Financial Services, said in an editorial in the Financial Express on Monday that the move to restrict trading positions “will squeeze liquidity and make risk management much more difficult, will achieve precious little in terms of curbing speculative demand." Past efforts to prop up the rupee are hardly encouraging. India’s last large-scale intervention, a move in 2007 to weaken the currency by flooding the money market with cash and bringing short-term interest rates to near zero, sparked inflation. An April 2011 paper by Patnaik and fellow economist Ajay Shah on the experience of Indian policymakers with capital controls found them largely ineffective. If downward pressure on the rupee persists, the RBI could offer more incentives to exporters, such as subsidizing interest fees and allowing short-term money to enter the local bond markets without any restrictions. It could revert to measures last seen during the Asian financial crisis, when India charged punitive interest rates on overdue export bills. The RBI also raised policy interest rates at that time, an option that is off the table now as growth in the economy slows after 13 rate increases since early 2010. “The structural problems like the current account deficit, trade deficit and a weakening economic growth trajectory remain bothersome for the currency and solutions to these need to be found soon," said N.S. Venkatesh, treasurer at IDBI Bank.